Son of NFL quarterback Archie Manning and a star in college, Manning was chosen by the Colts with the first overall draft pick in 1998. It didn’t take long for him to justify the selection as he set NFL rookie records with 3739 passing yards and 26 TD passes. He led the league with 575 pass attempts, also a record for a rookie at the time, but also with 28 interceptions on a 3-13 club. The record turned around to 13-3 in ’99, the Colts qualified for the postseason, and Manning was selected to the Pro Bowl for the first time as he passed for 4135 yards and, while he again threw 26 TD passes, his interceptions dropped to 15. A classic drop-back passer, he lacked his father’s mobility but made up for it with a quick release – not to mention an excellent work ethic. Manning led the NFL with 357 completions, 4413 yards, and 33 TD passes in 2000 and again was chosen for the Pro Bowl. Following a lesser year in ’01 as the Colts dropped to 6-10, he bounced back with a third Pro Bowl season in 2002, passing for 4200 yards (his fourth straight year over 4000) and 27 touchdowns. The team was back in the playoffs, but for the third straight time Manning and the Colts came up short in their initial postseason game. In 2003 he achieved consensus first-team All-NFL and MVP consideration for the first time as he led the league in completions (379), completion percentage (67.0), and yards (4267). This time the Colts advanced to the AFC title game before falling to the Patriots. Colts went 12-4 to finish first in the AFC South while leading the NFL in passing offense (4623 yards), scoring (522 points), and touchdowns (66). Won AFC Wild Card playoff over Denver Broncos (49-24). Lost AFC Divisional playoff to New England Patriots (20-3). 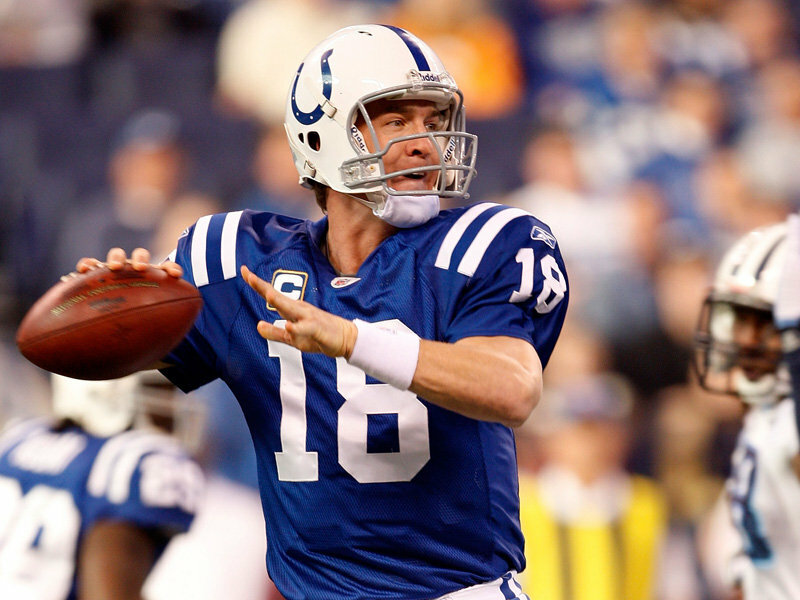 Manning was consensus first-team All-Pro for the third consecutive year in 2005 and, in ’06, finally overcame years of frustration in the playoffs as the Colts won the Super Bowl. Manning led the NFL in TD passes with 31 that year, against just 9 interceptions. Overall, he started 227 regular season games at quarterback, with 208 straight, until sidelined for all of 2011 with a neck injury. Released by the Colts and signed by the Denver Broncos for 2012, Manning made a successful comeback and led the NFL in completion percentage (68.6) while passing for 4659 yards and 37 TDs, garnering consensus first-team All-Pro honors for the sixth time as well as selection to a 12th Pro Bowl. Thus far, he has passed for 59,487 yards, with 12 seasons over 4000, and 436 TD passes.